Hello! We are Renewme SkinClinic. I wanna talk about Lifiting. especailly, thread lifiting today. About Lifiting, there are two kinds of liftings which are laser lifting and Thread lifiting. In laser lifting, thre are ulthrea, theramage, and shurink etc. 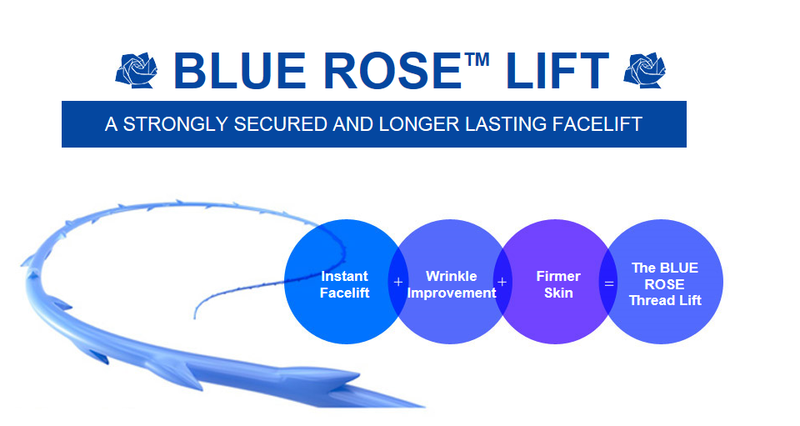 The other lifiting is thread lifting which is melting (PDO) called Blue Rose Face lifit. Blue Rose Facelift. it's needle and thread lifting. Today, I am talking about Blues rose lift. It's nearly free of paing and downtime. Pattients experience munimum swelling, bruising and can immnediately return to thier routines. Blue Rose lifit effects last three times longer and scrues three times stronger on the skin and also three times higher tensile proterties than other thread lift. I will show three pictures for before and after each patients having Blue Rose lifiting. Can you seen the dropping chin line on left picture? We can see the difference her V-line on right after pictire and she has narrow facial features. Also, she can have smooth smile line around her lips. Furthremore, she has more shinny face after Blue rose treatment. Yon can see visual result from before and after pictures. After lifting treatment, she got more V-line facial feature than before. Her friends ask her that she looks more shinny and have more an oval face. She is really satisfied on her results from Blue rose lifting. Also, the other patient who are in 50's ages have Blue Rose lifting. Before treatment, she looks cranky and has more doulbe chin on left picture. After treatment, the patient has more V-line facial feature and get more smaller face. Also, she gets more disappearing her tiny wrinkles and her skin tone is more brighter than before. We can see the difference on her face visually. 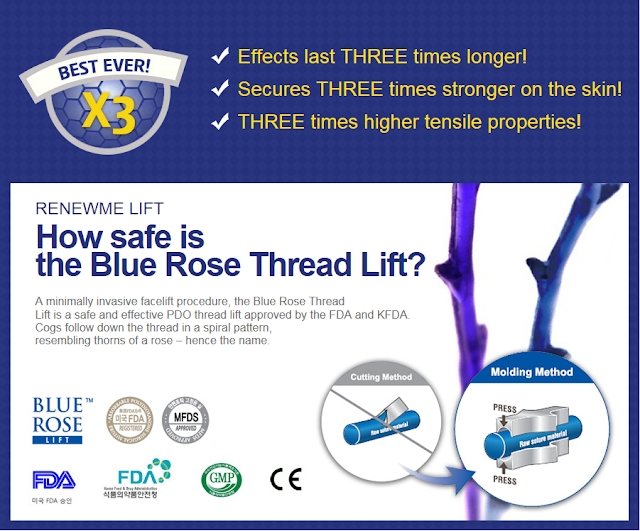 Renewme skin clinic use the Blue Rose Thread Lift is a safe and effective PDO thread lift approved by the FDA and KFDA.Cogs follow down the thread in a spiral pattern, resembling thorns of a rose – hence the name. PDO thread lifiting has results for immediately lifting effect and even help regenerating collegen in thick skin lawer and making skin more tightening. It also helps to have proe, tiny wrinkles, skin layer and skin tone as well. 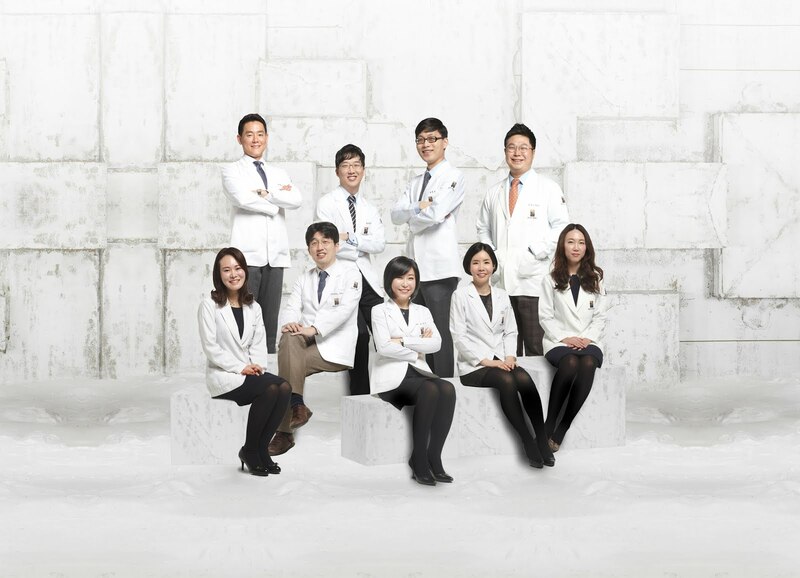 If you want to have more V-line facial feature than other laser lifting, we recommend you to come Renewme Skin Clinic and have consultation with our experienced doctors.